The boat and the fleet are fun and family-friendly. The Arizona Sailing Foundation uses the C14.2 as its primary training boat for new sailors, so lots of people are introduced to it during the Start Sailing Right classes and we’re happy to welcome new sailors or people learning how to race. 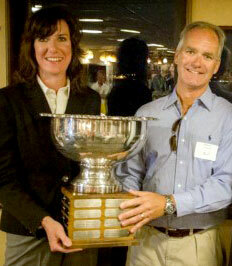 In fact, if you’re an AYC member, you might be able to “adopt” a club boat for the TTL Sunday series. The Capri 14.2 is a fun, inexpensive little boat that’s easy to sail, yet rewards sharp tuning, trimming, and helmsmanship. Built first by Capri, then by Catalina (and now called the Catalina 14.2), there are lots of boats available priced from a few hundred dollars to a few thousand. There’s also a national organization based in San Diego, which means you can tow your boat to Mission Bay and play with the big fleet of very friendly people at the Mission Bay Yacht Club. Many of the people in our fleet are husbands and wives or fathers and children sailing together, so it’s truly family-oriented—more than any other fleet in the club. The front of the fleet is sharp, with club and fleet champions duking it out, so it’s a good place to measure your skill. We race under the national C14.2 rules and the most important one to know about requires a minimum of two people on the crew and a minimum crew weight of 300 pounds. We allow one person in the boat if you carry enough (secure) ballast to bring the weight of the person-plus-ballast to 300 pounds. The reason we stick to that rule is that a light boat has a tremendous advantage in light air. If you’re racing with a child you might also need some ballast to meet the minimum weight. Here are the local rules for the fleet. Here’s a brief introduction to TTL race procedure for people new to it. There’s been one formal protest in some 14 years of racing at TTL (we tried to talk him out of it). If you foul another boat or a mark, you take your turns. Also, it’s wise during warm weather to come armed with a water blaster. You’ll see why. 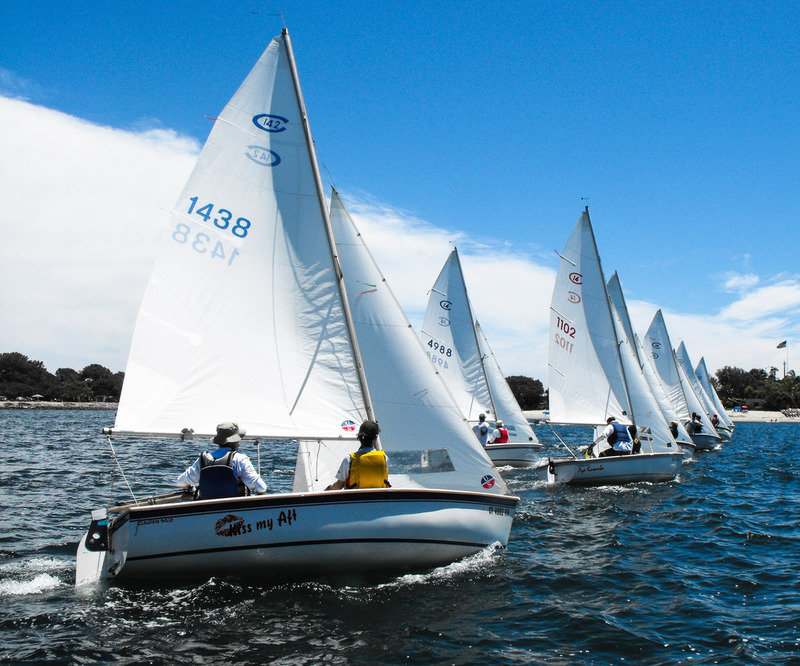 A start during the 2015 C14 Nationals at Mission Bay Yacht Club. That’s Martin and Cedric Lorch in the foreground.